My “Christmas Come Early” post and prediction led to 53 cayenne peppers coming off the plants in one single picking. Already about 25 or 30 more are ready to be picked I am just waiting on the last few to turn red. Then I will pick the next batch and start the next string. 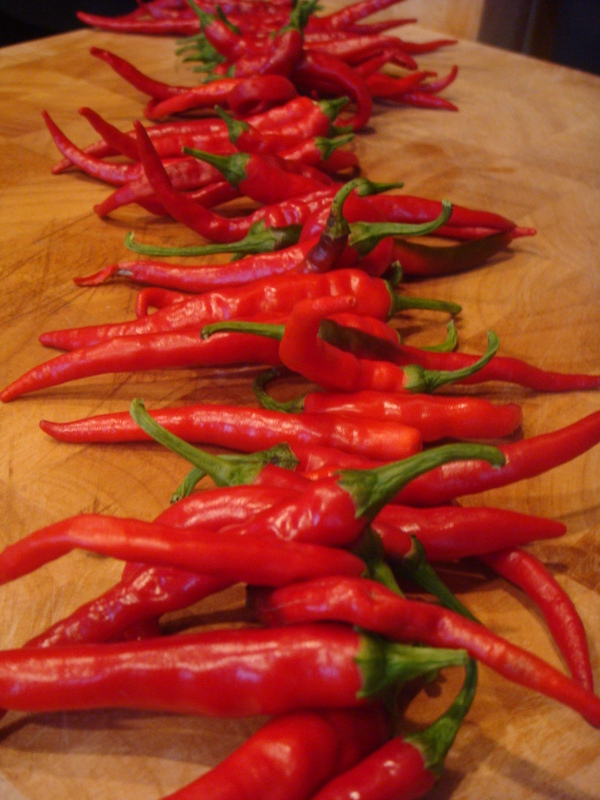 What I love most about growing cayenne peppers in the garden is that they are so easy to decide what to do with. I have found that the random button that appears in everyone’s drawer, a sewing needle, and a piece of thread is all you need. The button is used to secure the bottom of the string. Without it, as I found through experience, provides a surface which the peppers will not break through. Last season when I first tried stringing up my cayenne’s I awoke everyday to find peppers on the ground. After looking at the fallen peppers I noticed it looked as if they were being torn by the string due to the weight on top of the bottom. Since using the everyday button (which we all get on a new shirt or pair of pants yet rarely ever use) not a single pepper has fallen of the string. I like to string up 50 or so peppers on one string and hang them up in the kitchen to dry. Then when needed in a recipe I pull of what I think will provide the called for amount and powder them in my spice grinder for fresh cayenne pepper. This is a flavor that can never be obtained from store bought spices and is so easy and fulfilling to do. Great tip about the button, thanks for that. How do you finish the end to hang? I’ve always run the needle and thread through the green, top end of the peppers. The tissue is tough and the peppers stay put. I would love that! Hope everyone enjoys. Thank you.